We have several outboard motors, and fishing vessel motors. We have three Kahlenberg engines dating as far back as 1910. The newest addition to the engines is a 1917 Kahlenberg that was fully restored by Kurt Krueger. The engine sat outside for more than 25 years. 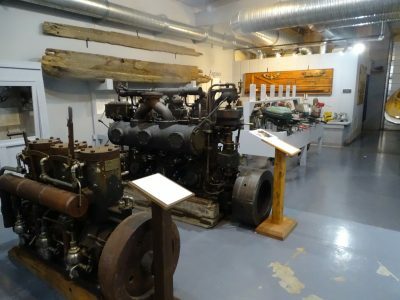 It is originally off the fishing tug King in Ellison Bay, and had been in storage in Sturgeon Bay following Krueger’s ambitious restoration project. It was moved to Gills Rock on July 13. It is now one of four Kahlenbergs in the Death’s Door Maritime Museum.